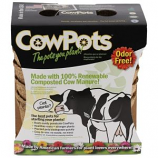 Plantable cowpots are all natural biodegradable made with 100% renewable composted cow manure from connecticut dairy farm.. Cowpots will stay intact for up to 12 weeks after planting seed and before planting in ground. Perfect seed-starter pots; roots easily penetrate the walls of cowpots. The. Eco-friendly cowpots are great for all types of gardens and gardeners. All natural made with 100% renewable composted cow manure. 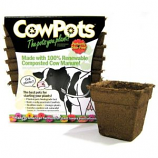 Cowpots stay intact for up to 12 weeks before planting in the ground. Great seed-starter roots easily penetrate the walls of cowpots.. The. 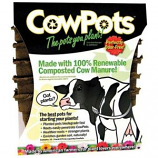 Cowpots are great for all types of gardeners. All natural made with 100% renewable composted cow manure. 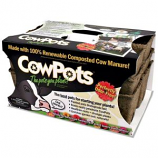 Cowpots stay intact for up to 12 weeks before planting in the ground. Roots easily penetrate the walls of cowpots. Perfectly odor free. Enriches garden soil naturally.